“That was fucked up... in an artistic way,” said a frank member of the audience at the end of the first Tribeca screening of La Enfermedad del Domingo, better known as Sunday’s Illness here in the US. You could hear every breath and movement at Cinépolis Chelsea Theatre as the closing credits ran. Director Ramón Salazar had taken us on a 113-minute journey through a mother-daughter relationship in a way that neither Spain nor Latin America is quite accustomed. Sunday’s Illness premiered at the Tribeca Film Festival on Thursday night, months before it makes its way to Netflix. With exquisite cinematography, alluring silences, and breaths in the script, which allow the viewer to be uncomfortably present and the actresses to be extra emotive—plus a simple yet layered storyline—the movie is nothing short of a masterpiece. Like renowned Spanish director Pedro Almodóvar, and many of the women filmmakers creating feminist indie works across South America, Salazar dives deep into complex relationships. In the film, a daughter (Chiara, played by Barbara Lení), confronts her mother Anabel (Susí Sanchez), 35 years after she abandoned her at the age of 8. Chiara’s only request, despite being offered money and basically any other alternative, is to spend 10 days out in the woods with her mother. Though Anabel’s husband, and most viewers, expect Chiara to use that time to get questions answered and to make her mom suffer for what she’d put her through (or perhaps even kill her), Chiara’s time is short and she has, surprisingly, no interest in vengeance. Anabel, likewise, has no interest in being overly apologetic. Throughout the 10 days, the two let their tension simmer while putting minimal effort into filling the spaces, both in their lives and in conversation. (After much minimization and dialogue removal on Salazar’s end while writing and editing the script, he decided to let “silence speak much more than their words,” he told me in a post-screening interview.) Chiara and Anabel just are—until Chiara tells her mom she needs one more thing from her and, unlike the telenovelas and movies of my childhood, the request is not related to riches or romance. After re-running the climax of the film in my mind several times that night while attempting, and failing, to verbalize the emotions the film as a whole had evoked, I met Salazar at the Roxy Hotel to chat about his creative process in our native tongue. Salazar, a Spanish director whose previous works are also women-centric and focused on the relationship between mother and offspring, admits there’s an unintentional theme in his work, but he made it clear that the botched relationships depicted in his films have nothing to do with his personal one with his mother. Instead, Salazar admits he actually explores those relationships with mothers on screen in an attempt to understand his relationship with his father, which is far from perfect. And when it comes to writing films with women at the forefront, Salazar continuously does so because he feels indebted and honored to pay homage to women, since they created a “species of barriers, and protection” for him during his infancy and youth when “being homosexual in Spain” during the ’70s and ’80s “was not at all easy,” he says. 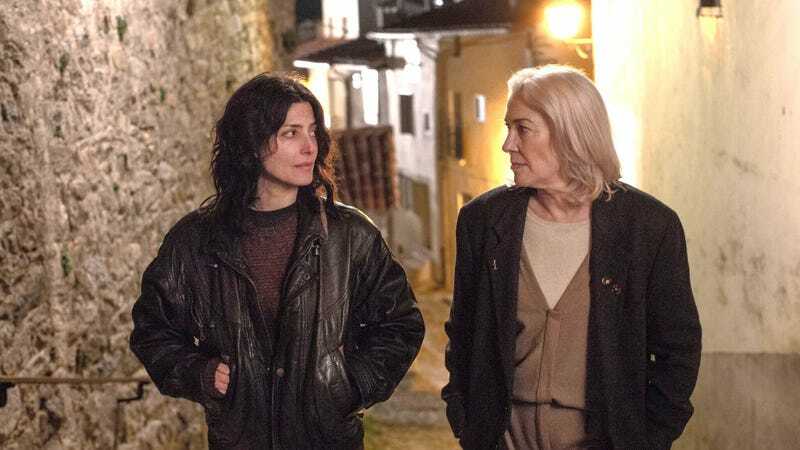 Still, choosing to write stories like this one in Spain, specifically centered around intimate, complex, non-melodramatic themes, with women over the age of 40 at the forefront, Salazar admits, has been difficult. Particularly, when it came to getting the film financed—a fact I more than suspect would be the same in Latin America. Telenovelas, on the other hand, which originated in Mexico and Brazil in the 1950s and slowly infiltrated televisions across Latin America, have always featured a very specific kind of woman and had predictable outcomes. At least that’s been the case in almost every one I’ve seen (with the exception of Rubi, which ended with the protagonist’s death). Telenovelas were the background noise of dinners and family time throughout my adolescence. After checking in years later, I see that it largely continues to be what it’s always been: melodramatic, barely fleshed out, and non-reflective of the diversity within Latin American culture, in a way that seems almost insulting and deprecating to the community it’s geared toward. Yes, I understand that telenovelas are primarily watched during off-hours and don’t need to be overly profound. No, I don’t necessarily want them all to touch on subjects like death and abandonment like Sunday’s Illness has, but—at the very least—I expect telenovelas and films like them to begin to assume a greater level of sagacity from their audience, and to add more intellectual depth to their stories without fear of addressing subjects in the Latinx community that have been taboo for too long. If you’re a content creator looking for inspiration and Exhibit As, prime examples are Sunday’s Illness and Spanish works like Las Chicas del Cable (Cable Girls), the show that captivated my attention last summer and raised my awareness of the daring array of work springing from Spain. The beauty of it is, less can be—and usually is—more. Though Salazar ended up stripping the script of dialogue and background information that would have further developed tertiary characters in the film, the silences (he also decided to remove music and have minimal camera movement) allowed for the viewer to feel enveloped in the scenes and to process both “what they did have to say, and what they were not capable of saying,” Salazar says. This artistic choice (also made in Dunkirk) is one I personally appreciate, but it’s seldom seen in Spanish-language and women-centric films, including Lady Bird, because I suppose women stereotypically like to speak and have a lot to say. But the truth is, I’d much rather see films explore that which is left unsaid in real life and force a hyperactive generation to ponder what we actively avoid. For example, our relationships with our mothers. In the case of Lady Bird, another mother-daughter film which I’m sure you’ve heard nothing about, I remember being elated and filled with very high expectations based on many, many, many reviews, the night the screener came in the mail. I stayed up to watch it and recall being highly disappointed and only sharing my opinion with my mom, and my Chicana friend and editor, Jezebel’s Julianne Escobedo Shepherd, both of whom I knew would understand. I quickly realized the movie was not made for someone like myself to relate to. Sure, the straight-forward issues a white teenager-in-Sacramento-who-then-moves-to-NYC-for-college faces are valid, and I’m glad people were moved. But what about the non-white teenager who grew up with an ill mom and isn’t able to express her frustration and emotions as candidly and explosively? Or the teenager who grows up and finds her mother who gave her up for adoption when she was 16? And the so many other complex and not so easy-to-swallow mother-daughter relationship films that have yet to be written about? Sunday’s Illness hit an emotional mark, and there are plenty of other ideas out there for filmmakers, screenwriters, and telenovela producers to follow suit—to create art rather than replicas, while pushing the boundaries of what’s acceptable. Correction: An earlier version of this story set Lady Bird in San Francisco. It is set in Sacramento. Sunday’s Illness premieres on Netflix on June 15.